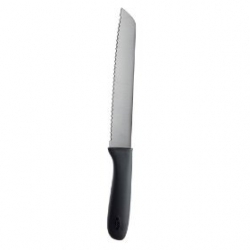 OXO Good Grips Bread Knife has sharp, serrated stainless steel blade that slices through crust with ease. The Bread Knife has a soft, contoured handle for a safe, comfortable grip that won't slip, even when wet. For best results, hand wash and dry promptly.